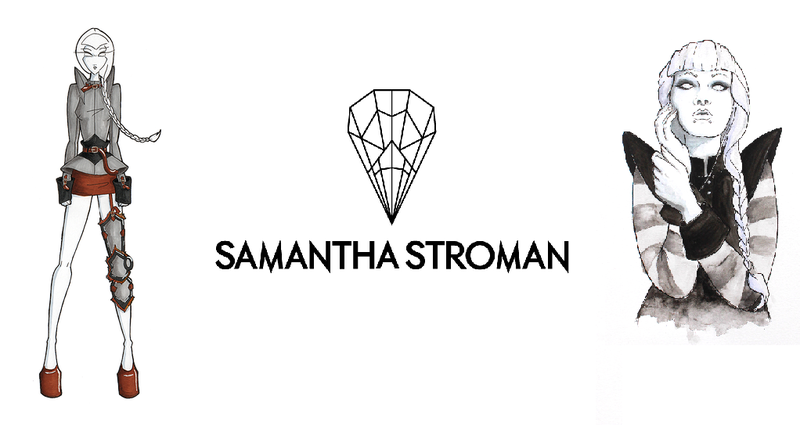 Samantha Stroman is not your typical graduating Fashion Design student. 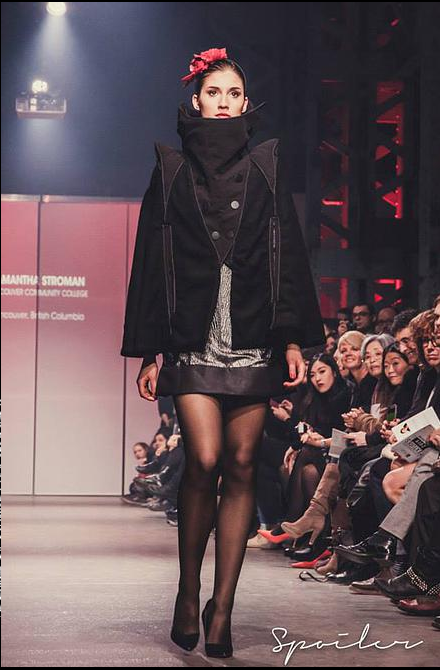 In fact, in 2012 she already had a collection on the runway at Vancouver Alternative Fashion Week (VALT). 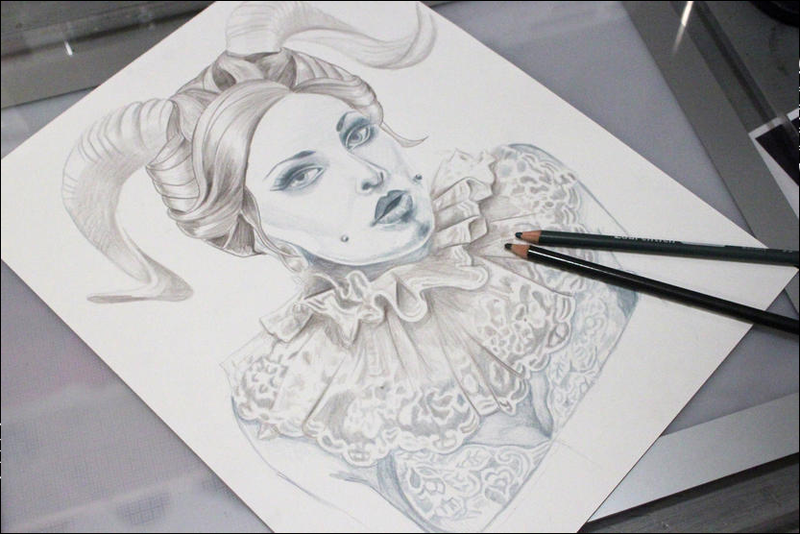 Her polished website features not only her corsetry line - Eternally Waisted - but an illustration section showcasing artwork that gives an idea of her artistic range. 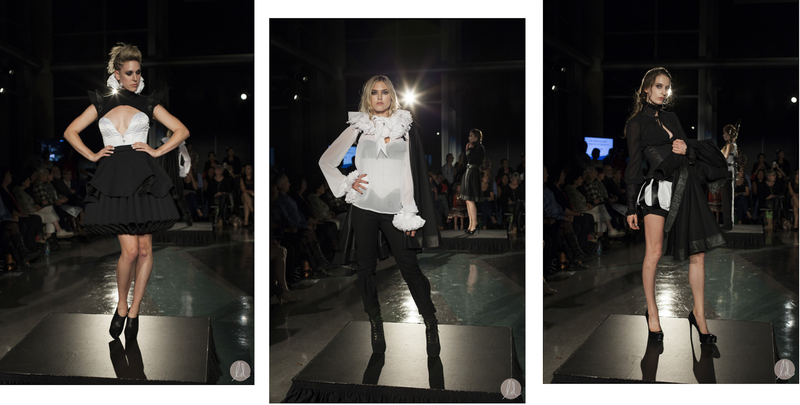 This talented designer caught the eye of Telio Fabrics, who selected her as one of the finalists in their Canada's Breakthrough Designers Competition 2014. So it's really no surprise that her grad collection caught my eye. me. 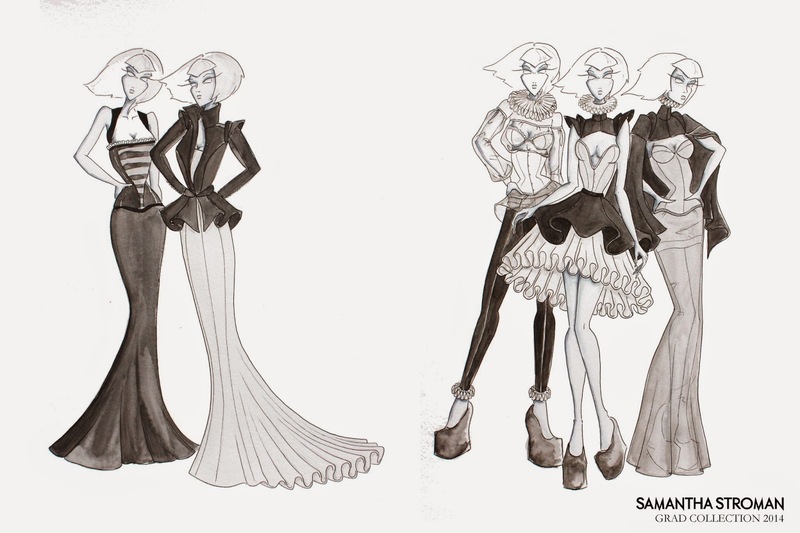 Stroman's grad collection illustrations gave a great feel what she was going to showcase that evening. They were edgy and out of the box with a look that could be applied to stage costuming or alternative evening wear for those wanting to stand out. Then on the runway - the final looks delivered on that promise. Great fabric choices, excellent construction and interesting silhouettes. Stroman went on to show again at VALT 2014 - a night I unfortunately missed, but I have included some images at the bottom for those who would like to see the expanded collection presented. As well - I am such a huge fan of illustration, I couldn't help but add a few other samples from her website. There is a link at bottom for those who want to see more. For the most part, quiet! I kind of kept to myself a lot, but was always very independent. Fine art, theatre production and history were always my favourite studies. By grade 12, my course structure was composed primarily of photography, illustration, history, and drama courses; including a few after school classes each week. Most of my instructors were so supportive of my work in arts and theatre, that they would knowingly let me skip classes (such as physics) to go finish up work in the darkroom, the school theatre, or to continue on some painting project. Really, fashion was one of the first career paths I was truly interested in. I remember in grade 9 when we had to select our elective courses for the year, I was so concerned about my course load for the remainder of my high school career, that I convinced the vice-principal to enroll me in the grade 10 sewing course and skip me ahead a year. It was the only feasible way I could end up in the grade 12 fashion design course, without having to sacrifice my other academic interests. I was already looking into fashion schools around the world, although I hadn't settled on any specific school to apply to. I always made or altered my own clothes, and excelled in my sewing courses, but in the end, I didn't even take the grade 12 fashion class that I pushed so hard to get into in the first place. By then my interests had just shifted so much, and sewing had become more of a hobby or just a means to have that perfect skirt for the next school day. After high school, I completed my Bachelors of Fine Arts from Emily Carr University. During that time, my love of history and historical techniques really blossomed. I continued to sew various things on the side, even working stitching into some of my photography projects, and always had a goal of one day making my own corset (but it would take years for this goal to finally come to reality). With a father working in film, I found myself working part time and during the summer breaks on local TV shows as a production assistant. And when my studies finally came to a close in 2009, I began working full time on the TV show Smallville, really not knowing what I wanted to do with my life. School had taught me many things, but I felt like none of these skills I had honed were really in any way related to how I wanted to spend my days and make a living. At last, in 2010, a friend and I took a continuing studies night course at VCC in the art of corset making taught by Patrice Godin. Finally I had made my own corset, and had kind of re-discovered my love of sewing and creating garments. It was pretty much then that I realized that that was what I wanted to do. It just took me a couple more years to really gather up the gumption to go back to school. Both my parents and my fiancé were supper supportive of my decision. 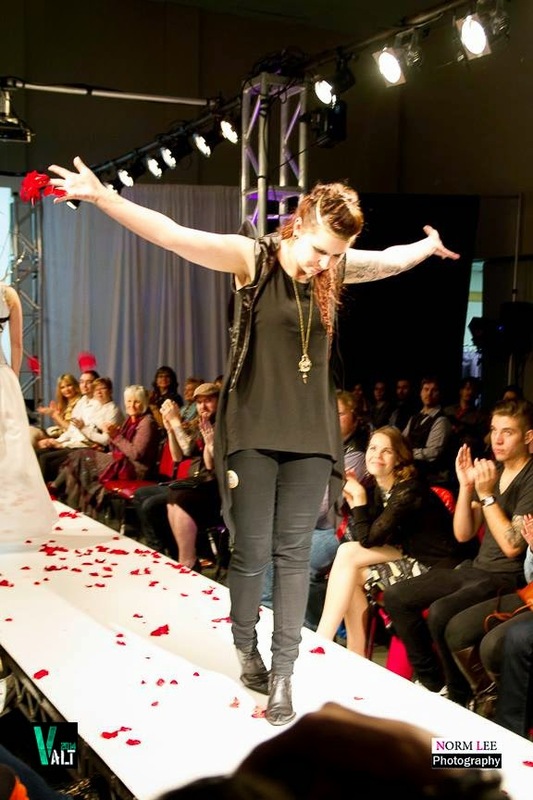 Why did you choose to study at Vancouver Community College – Fashion Arts Diploma Program? I decided to study at VCC mostly because in comparison to the other local programs, I preferred their course structure. It’s a full time two year program, with a heavy emphasis on technique. I went into the program wanting to know how to construct, how to draft, how fabric choice makes a difference; and I am definitely happy with how much I leaned an accomplished by VCCs excellent array of instructors. I really enjoyed my time at VCC, but it certainly wasn't a breeze. The course load is very heavy, 30-40 hours of class time per week, plus extensive homework, and I worked a part time job on two of my days off. Basically, I had no free time whatsoever. I was surprised however, to find myself excelling as much as I did. I remember finishing my first semester there, and thinking to myself “wow, this is what it feels like to truly enjoy what you’re doing”. When I started the program, I completely expected to be an underdog; I felt like I was predominantly self taught at the time, and never being super interested in trends or fashion labels I was worried that I would have a hard time keeping up. In the end that wasn't the case. Upon graduating I was granted the Gabriel Levy scholarship for “highest academic achievement” in my class. But it really did take a lot of work to get to that point. Enjoying something is one thing, but I really did try to put my all into every project and every class. It was hard, but I never got sick of it, and managed to find a way to make each project count in its own way. I think with any schooling (especially art related), there are all these open ended projects that come up, and you really have to try and focus all your efforts into something that is really relevant to your own interests. I tried to do that with every project, and I really feel like it paid off in the end. 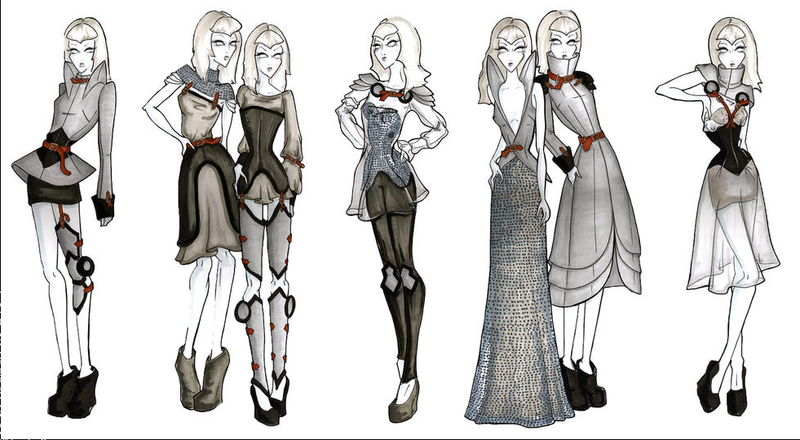 My grad collection was inspired by Elizabethan Menswear and Vintage Science Fiction. It’s monochromatic in tone, and explores texture and contrast by way of a multitude of fabrics. Predominantly black in colour, bold streaks of white and silver enhance elaborate shapes and voluminous silhouettes. It’s comprised of fabrics in black, white and silver; including Melton wool, leather, satin, “sticky grip”, neoprene, and a variety of other synthetics. No, but I have a favourite piece. 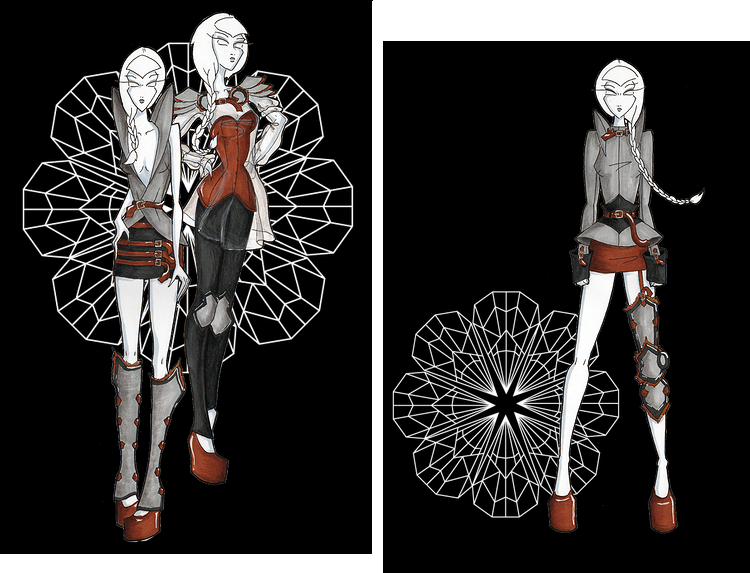 My ruff inspired neoprene knee length skirt; which I think is mostly my favourite because I’m still so in awe that I was actually able to make that illustration come to life! It’s comprised of 6 meter of 60” wide black neoprene cut into 31 panels. It weighs a ton, and can stand up on it’s own! You mention participating in VALT 2014. Talk about why you chose to show at this event and what the experience was like. This years VALT was such an amazing success, and I'm so happy to have been a part of it! 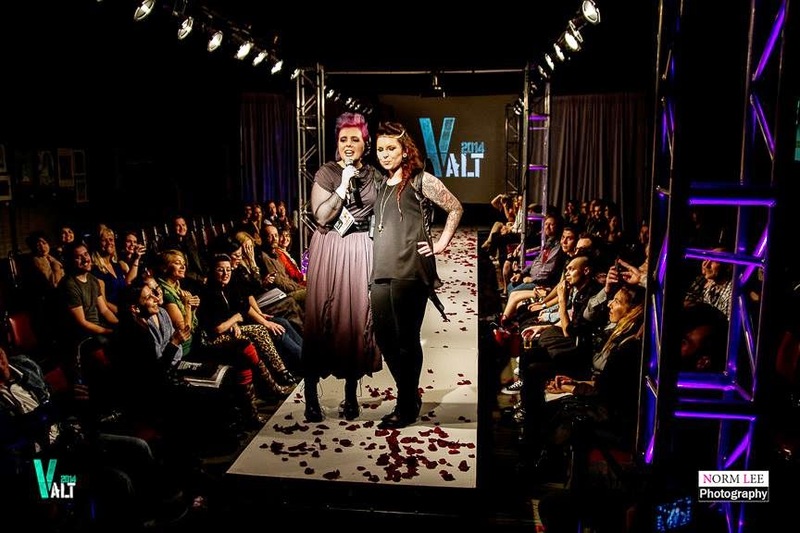 In 2012, just about the time that I submitted an application to VCC, I was invited to apply to VALT based on my etsy corset shop. I showed a six piece collection, and although I was nervous about my first show (and totally swamped with homework from school by that point), I was so amazed by the caliber of the event, and the enthusiasm of the producers of it. 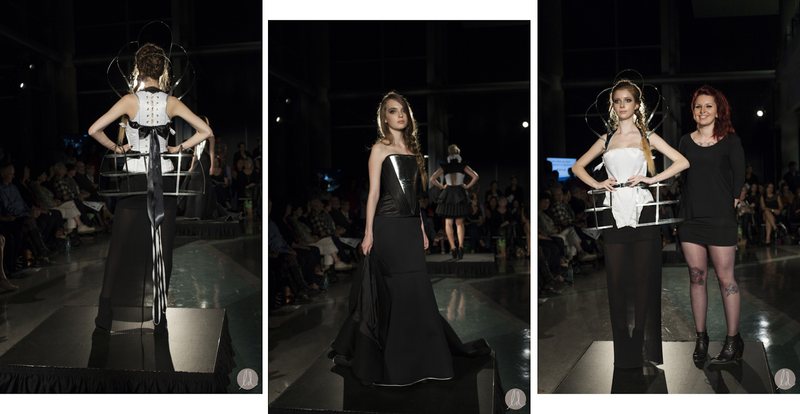 By the time I was designing my grad collection for school, I knew I wanted to try and show it (or a version of it) at VALT 2014. I really enjoy the type of event they put on. It's fun, multifaceted, and I have met so many amazing and creative people through it, whether it be the organizers of the event, other designers and artists, the models, or even just people attending the shows. They're looking to make an exciting and immersive event, and with each year they just keep getting better and better! And I love that they really try to give their designers full control of the runway. I mean, you can pretty much have your models do anything, for as much length of time as you want. This year I had my models sprinkle rose petals as they walked down, and afterwards during our photo session, we threw buckets of rose petals into the air and all around. We really made a mess of the place! I can't thank the organizers enough for letting me do this (and for cleaning it up after!). It was such a magical string of moments. Illustrations created by Stroman for group projects while in school. New I don’t know about. All of my inspiration comes from the past, its just the love of history in me. I think the only thing new I can offer is my own unique perspective on things that may be old or familiar. I’m currently working in film in the costuming department, which was a goal of mine from the conception to going to fashion school. With that said, I do intend on continuing to work on my own projects on the side, I just don’t know to what end at the moment. I am however, always available for custom corset creation! 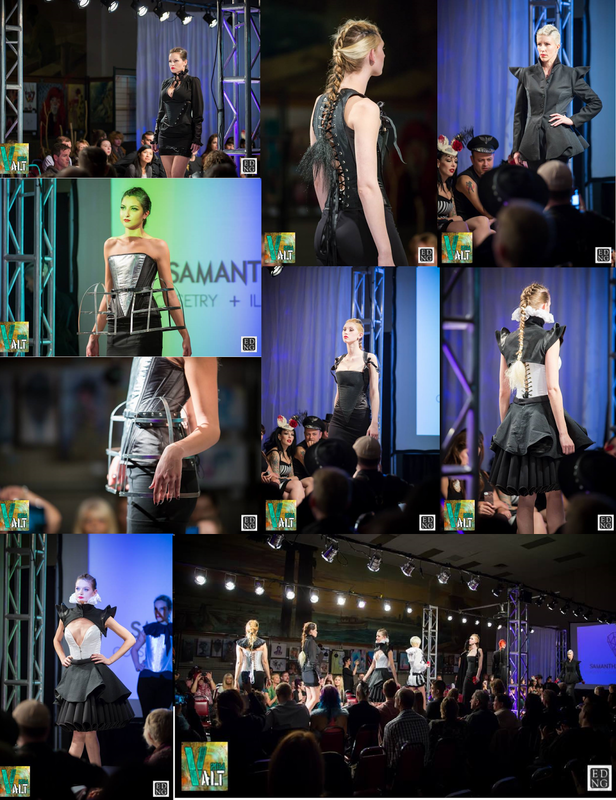 Image Collage from Stroman's VALT runway show by Ed Ng.